. 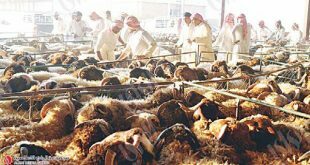 A security source said these butchers will be deported from the country for violating the residence law because those who have been arrested have nothing to do with the work of a butcher. On the other hand, the Hawally police raided an unlicensed slaughterhouse in the area and arrested a number of expatriates. The campaign was organized by the Interior Ministry on the first day of the Eid based on instructions given by the Assistant Undersecretary for Public Security Affairs at the Ministry of Interior Major- General Ali Madi.